Is Hell feeling a bit chilly? Are pigs taking to the skies? It might be prudent to check, because Head of Xbox Phil Spencer has voiced the opinion that he would love to see Nintendo games on the Xbox One. It's an outlandish statement, but one which has a logical root. It has just been confirmed that Minecraft - a Microsoft-owned property - is coming to the Wii U - a Nintendo-made console. Someone on Twitter clearly picked up on this and put the question to Spencer - could we see things heading in the opposite direction? Sad that we won't see the Goldeneye remake anytime soon. I still hope we do eventually. Well, anyone would have to be a fool not to want to see Nintendo's games on their platform. 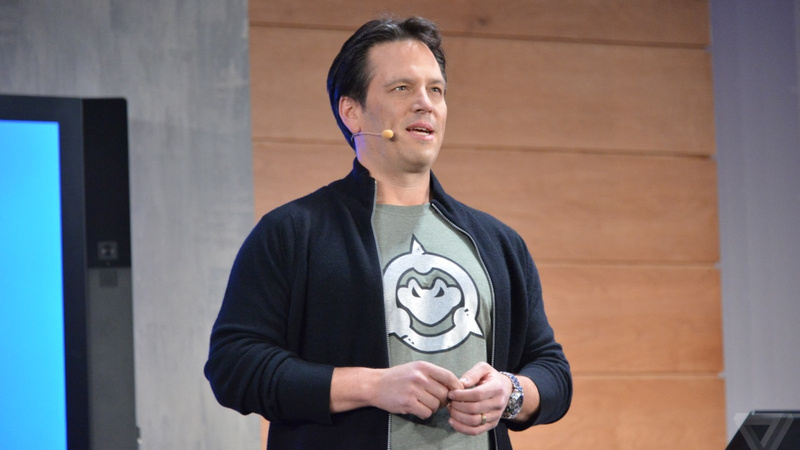 I like Phil Spencer more than the last guy. The last guy was just unbelievable in his stupidity. Whereas Phil seems like he's not a complete idiot. But Phil, Minecraft is nice and all, but gamepad inventory or don't bother. Microsoft is a scourge on the industry. How about we keep Mario and the gang and you give us Banjo as well? We'll trade you the rights to Sticker Star!! I thinks its only fair to share Goldeneye with them. No Mario games though! I've never really been a fan of Xbox as a whole. For my gaming needs, I usually stick to PC and Nintendo (and my friend's PS4 ), but as much as I dislike Xbox, I can't dislike Phil. He looks so genuine and nice, like a Western Miyamoto or Aonuma or [insert lovable Japanese developer here]. Concerning seeing Nintendo games on Xbox, I do hope that he meant "Nintendo developed" and not "Nintendo franchises". Because, for the latter... just no. Read: he wants to see Nintendo pull a Sega and ONLY put their games on XB1. Calling it, NX stands for Nintendo Xbox. @Wouwter I think that was already called on Monday. This may just be me, but when I excitingly revisited Goldeneye, I couldn't help but feel that it did not age well. I couldn't wait to go play a modern shooter. It was awesome when it came out; and my friends and I played it all the time. So on that note, they can have it. As for Phil, I don't know the guys so I don't know if he's "a good guy" or not. I will say that he's a good business man though. Also, who doesn't want Nintendo games on their system? @Whopper744 Sticker Star is the best you could come up with. I say give them all the Yoshi games ever made and maybe they could strike a deal! Give them Chibi Robo games for Rare Replay. That'd make me quite happy. Ok Phil then how about you ask them to add touch screen support to Minecraft and actually put effort into it and maybe Nintendo will allow that???!!!! I'm not opposed to the idea. Nintendo is always trying to widen its audience, after all. And just think of Nintendo and Microsoft working together on a new Banjo Kazooie game. I don't even think the xbox haters would be opposed to that. Nah, there's no need to even make this an article at all really. It's not going to happen, and what's his point when he says that he'd like to see it happen? Xbox owners are stereotyped perfectly, A.K.A they wouldn't even buy Metroid or Zelda in massive amounts if they went onto their platform, let alone Animal Crossing, Splatoon, Pikmin and the like. Or does good ol' Phil like how Microsoft kill franchises because no one on Xbox buys them a la Conker's Bad Fur Day (which Microsoft cancelled a sequel of in favour of, of course a Perfect Dark game) and Banjo-Kazooie? That's the only way that statement would make sense. Concentrate on getting Rare to make Banjo-Threeie Phil, I'm one of mabye 10,000 Xbox One owners who would buy it, and that's being generous. I hear you. With the industry in the state of flux it's in right now, who knows what the future will bring? Phil Spencer is such a nice guy, I feel sorry about his daydreams being, while not impossible, at least highly unlikely. However, it would be still more likely if, say, we saw Halo on Nintendo systems; most likely he said this as a tradeoff for Minecraft being on WiiU. @RainbowGazelle Well darn, re-calling it then. These days, anything can happen, I guess. I mean, who would ever have thought that Cloud would come into Smash Bros? And that Microsoft would put Minecraft on Wii U? As far as I'm concerned, Hell is now completely frozen over and colder than sitting in a freezer in your underwear way up in space. There's not much that would surprise me anymore at this point. People seem to be jumping to conclusions a bit. He's saying he'd like Nintendo games on Xbox. He's not saying that he expects this to happen, and he's not saying that he wants Nintendo to turn into Sega. More than anything I appreciate the fact that heads of companies are more open and not at logger heads (publicly) like they used to be. It's a much healthier attitude to have. Also, as for the future. Who the hell knows? Many thought Microsoft wouldn't have made a console in the first place. Many thought Nintendo and Sega would never co-operate on anything. Many thought that Shenmue 3 would never be announced. But here we are. @abe_hikura That situation was going to happen but Nintendo were the ones that backed down. Rare have a finished version of Goldeneye ready for XBLA and Nintendo, Microsoft, Activision and EA had all agreed for that to go up and at the same time the VC game go up on the Wii. Weeks from it happening, Nintendo pulled the plug because they felt MS were getting the better deal from having a HD version. Well, Nintendo games on Xbone would certainly make more money than sticking with the Wii U.
Phil is a great guy though. He genuinely seems to love gaming and really understand what makes the industry tick. I like Phil Spencer, I really do, since he is cooperative with Nintendo whenever necessary (mostly VC games of Rare games, and maybe in the future if one of Rare's characters is picked from the Smash Ballot...), but he already has Nintendo games in that Rare Replay collection. Don't get greedy, Phil! If somebody at Sony said this they'd be vilified somehow Phil Spencer always gets this 'well isn't that nice, look what he's doing for the industry.' Nonsense. He's doing a decent job but he's the same as any other figure head so I really don't know why he has grown-a$$ men slobbering all over him, it is ridiculous. To be fair some of those 'great job Phil' comments are from some of the most mind-controlled corporate slaves on youtube, but it's still scary that people are that obsessed with a brand and I'm sure Spencer finds it a bit weird himself the way some people hang on his every word and are quick to go to his twitter account with this 'you're the best, we love you' stuff. But on topic, who wouldn't want Nintendo games on their console? For that matter, I'm sure Phil Spencer wouldn't also mind seeing Uncharted on Xbox. When it gets to the point though, and I believe it is going to happen eventually, where we're playing Nintendo, 343, Turn10, Naughty Dog, Sucker Punch and Polypony games all on the same system, we're in trouble as consumers. For the sake of the industry, hopefully you're right. Nintendo games on a home console with a brand label other than 'Nintendo' wouldn't be right, simple as that. After reading this, I won't be surprised if Nintendo and Microsoft came to terms to put Banjo in Smash. I would prefer Conker though lol. Can't help but notice that Phil has a Battletoads shirt. I want a new Battletoads game. I like Phil Spencer, I like his genuine respect and love towards Nintendo. Seems like a nice guy. One thing though, sorry, Nintendo games stay on Nintendo consoles, I hope it NEVER is any different. There is no where else I would want to play Nintendo games than on a Nintendo console. EVER. He replied to a friggin tweet...the title made it sound like he made some sort of statement. Of course they want Nintendo games. Who wouldn't want Nintendo games!?!? Minecraft on Wii U could be part of an ongoing discussion about a merger between Nintendo and MS. Nintendo takes over all gaming projects at MS and gives them access to the Japanese market; MS continues to do the business software thing. It's not impossible! And as much as I think Windows is a crap OS that I'm forced to work with in my day job, I don't think the company is "evil" - they have a predatory and monopolistic past, but it's not the 90s anymore and they know they can't rest on their laurels. I think Mr. Spencer's humility is very much in keeping with the new corporate attitude there. Only if it meant GoldenEye re-make would simultaneously come to NX first (assuming NX is more powerful), and Nintendo had a timed exclusive (albeit for a shorter time than a year or whatever is standard). But only GoldenEye or some other Rare games (if Microsoft want it badly enough, why not secure sequels to those N64 games whilst they're at it). This obviously confirms that next Metroid title will be Xbone exclusive! @bezerker99 With Master Chief pre order DLC and Battletoads just so we can say the game has Battletoads! Hasn't goldeneye already been remade? On Wii? @sillygostly In what way? They follow generally the same business practices as Sony and have a far better online product than either of them. They consistently upgrade their hardware are listening to their fans and have a slew of awesome exclusives here and on the way. @FullbringIchigo Wow, fanboy much. Microsoft has a killer line up of exclusives right now. Nice try though. Of course Spencer would like that, it's his job to make the Xbox as best as it can be. Everybody wants Nintendo games on their systems, of course. But Nintendo clearly knows it would effectively kill their console division. So, Phil, sorry, you're a cool guy, but no thanks. I'd say bring XBox's games to Nintendo, but, what? Halo? Meh, just forget it. I'll take Ori and the Blind Forest on Wii U please! Only M$ exclusive I've ever cared about. I have it on Steam but would buy it again on Wii U in a heartbeat. I think this is a fantastic opportunity for Nintendo to dip their foot in releasing a game on another console giving a chance for other consumers to revisit Nintendo developed games and franchises. I think that they should release the next Zelda game on x box one maybe 6 month after releasing it on wii u or nx. Minecraft is no small property and a Zelda game should really help remind and show noon Nintendo fans the quality Nintendo can offer. Sure I'll buy it on my wii u but some ppl will be given a chance to buy it on new system. @Spoony_Tech Hey now. Let's not bring my buddy Yoshi into this. I'd trade Pokemon for Banjo though. Ooh... do I smell a gritty remake of Ice Climbers?!? I've got the current generation of hardware save a PS4 (saving up for a move; next year, then), and I like the distinct feel and ecosystem of each. Maybe there isn't room for three, but I like things as they are. I would so love to see Nintendo and Microsoft work together. That could mean that Nintendo controllers are automatically supported with Windows. The only things that might make some sense would be mini-type games that they plan on putting on mobile devices anyway. Is Pokemon Shuffle that sacred? The other thing that would make sense, would be to allow Amiibos to work with other platforms- in the sense that they would unlock demos and maybe even play some sort of simple game outright. All of this would be geared to introduce players to Nintendo characters and to traffic to Nintendo consoles where the full game can be played. Doubtful that MSFT would go for such a set up. @Gamer83 This is true. Many people are infatuated at the idea of every single game ever coming only to the PC (i.e. Windows) as some sort of a "system to rule them all" (as if that worked well in JRR Tolkien's books) without taking into mind that it is a proprietary platform controlled by one of the major console players. I still think the industry need to keep competing at the platform level to remain healthy. I'd prefer having Sony, and/or Nintendo release their own game centric OS's that can work on general purpose machines instead, if ever the industry comes to that point. On topic: personally, I'd rather see Sony and Nintendo work on any project together, but we all know PS1 happened. I thought Activision had long lost their licence for James Bond 007, especially after the flop that was 007 Legends, and Eon Productions are not giving away their properties to any other party at the moment, keeping all marketing efforts in-house. @Spoony_Tech @Whopper744 I'd personally trade in the rights to amiibo Festival for Banjo-Kazooie. Not to defend Sticker Star, but at least it introduced some ideas that I think would be beneficial to a traditional Paper Mario RPG (i.e. Increased Coin Cap, more emphasis on exploration, Secret Door stickers, action-oriented elements in the overworld, multiple character animations, and 8-directional Hammering being the few). Lets give X1 exclusive Metroid Prime 4 online in exchange for Banjo. This will never happen, not in a million years. Even if Nintendo were to shift to competitor consoles they'd probably go with the PlayStation. First of all the Xbox barely has any market share in Japan, the location Nintendo tends to primarily focus on (though I know they're starting to open up). Secondly, Nintendo's philosophy clashes greatly with the impression I have from the Xbox development team. Granted, I only really know them through all the Did You Know Gaming videos, but from what I can gather they clearly aren't on the same wavelength. Sorry Phil, keep dreaming. Yeah screw that, I've never been a fan of Xbox consoles. Always supported Nintendo and Sony. So the Rare Replay collection wasn't enough? I've always had a lot of time for Phil Spencer. The guy just seems like a decent human being. Isn't there a GoldenEye remake for the Wii? A pretty darn good by the way? I don't need another HD remake of a fantastic remake of a fantastic game. Bring the Rare Reply bundle over, most of the games belong in a Nintendo Museum anyway! Didn't you get a Rare Replay Collection Microsoft? You already screwed Rare and your own perfect windows by making the craptastic windows 8 and sticking with it despite negative backlash. Leave other companies out of it thanks. Bye. @FullbringIchigo Fair enough, my apologies. It just is irritating to me when I see people on here trash MS because the majority have no idea what they are talking about and are just blindly championing a business with Nintendo. I shouldn't have assumed. My bad. but you are right there is a lot of trash talking about other systems (in all directions) and there really is no need for it because at the end of the day the games are all that matter, not what box of plastic and wires you put it in. "Nintendo games on a rival console might not be likely, but then again, we said that about Nintendo games on smartphones..."
This point really can't be emphasized enough. Remember the years of interviews from nintendo execs stating how nintendo would never make mobile games, and how making mobile games would destroy their brand and all that. Yeah, seems a bit funny now. I feel like the magic that Nintendo games have would just dissipate. Might as well do a "Nintendo indifferent about Microsoft Games on Wii U or NX"...I know I would be. Unlike Nintendo, Microsoft offers nothing other than the same experience s the 3rd party folk can. Sure they have Halo but I've only just learnt there was a Halo 5 out recently, so I guees people are bored with that series already. Sony on the other hand, they always seem to have devs working on something different. Can you imagine Sony and Nintendo finally working together? Would be unstoppable. Not really. Alot of people hate Windows 8 and its like. It's unintuitive, unnecessarily complicated and a tad oversensitive and yet they continue to foist it on people, so we're stuck with it. @Rockmin- partly yeah, I part own/ am selling the xbox one and I'm honestly not a biggest fan of it. I think it's all about the feel, nintendo games have been nintendo console exclusive since forever, well - emulators, I guess its partly because I don't like the controller setup and the software of the xbox. I agree with what @Temperstryke said and I think it apply's to the xbox too. Microsoft knows Nintendo got the best games they can have GoldenEye remake and we can have banjo n koozie remake. People always blame Nintendo on Goldeneye 007 not getting a rerelease or remaster. There are so many avenues to thrash out. For instance Sony own Bond films? Activision own game rights, then who owns the books? Image Rights? Level locations and names? Sound? Music? I could go on! It's a legal and financial mine field. Still GoldenEye will always be best on original N64 hardware! It would be great seeing Nintendo and Microsoft working together. Imagine if rare replay came to the Wii U eshop! They are the only ones who could save your sinking ship at the moment. @Rockmin I learned it, I still hated it. Who randomly categorizes programs so you can't find them or puts settings over on the right side there often times messengers are so you're constantly bring it up. And why does a photoviewer need to take up the whole screen? 8 was bad design, that's why 10 went back to the design people are used to. @Einherjar well xbox is still selling better than the wiiU. Please don't do it Nintendo. You're better than this. Depending on how the NX goes this could actually happen if the NX struggles out the gate and Nintendo are unable to get third party support then we could have Nintendo Games on Xbox one and PS4. If Nintendo pulls out of the console game by then which at the moment there's a good chance it could happen. We will know all this by 2018 as the NX should be launching around xmas time next year. How about Rare Replay on Wii U instead? @Yorumi Yeah but with tons of money spent on marketing. Nintendo has virtually no ads anywhere. Only Microsoft and their fans bring this up. Everyone else has given up because they know better now but we have to do this with MS people at least once or twice a year. @Einherjar Yeah, because the company with the worst selling home console on the market right now is going to save anything. The PS4 and Xbox One were virtually tied over this year's black friday in terms of sell percentage(PS4 at 42%, Xbox One at 41%). The PS4 is doing better then the Xbox One, but people really need to stop with this idea that the Xbox One is selling worse then the 3D0 and has no chance to win this generation or at least come in at a good showing in second place. I have a question to you and everyone who keeps acting like the Xbox One is a sinking ship. Did people think the PS3 was a sinking ship when it was being crushed by the 360 and Wii during its first few years on the market? Eh...no. Games like Minecraft, that are already on every other platform? Sure, we can share it. But Mario or Zelda games on an Xbox? There goes Nintendo's exclusivity, and with it the fear that those properties will lose a lot of their magic. @Yorumi But not well enough that they dare to release actual sales numbers anymore and instead fall back to "active XBox Live accounts", which are alos active Skype accounts, active WIndows Live accounts, active accounts using a 360 instead etc. The One isnt doing well, and thats not a big secret. And Nintendo is gaining second wind with exclusive software, something pretty much entirely missing from its competitors. But its not the first time he wanted Nintendo to work for / with them. And you know what, exchanging sub divisions / 2nd partys wouldnt be all that bad. Get licensing deals for Rare games, let another team help out on a MS project. @Caryslan Actually, yes. The PS3 tanked horribly. So darn horribly, that several japanese studios banked exclusively on the 360, a US console. That has pretty much never happened before. Even flagship titles like "Tales of Vesperia" by Namco dodged the PS3 in favor of the 360 for more then a year. Yes, even companys considered it a sinking ship, a fast sinking ship. But consumer policys (no online gaming fee for instance), the BluRay medium etc enabled it to grow faster than the 360 could with its more draconic mother company. But it took an awfull lot of time to achieve that. The same could happen to the One, but frankly, i highly doubt that. They had to ditch their initial business plans, had to ditch the "mandatory" kinect, had pretty much all of their second party studios turn multi platform and created quite a lot of bad press all around. It would take a miracle to recover from all of that and overtake the PS4 at this point. @MarkyVigoroth Phil is just doing his job. I think the XB division is more concerned with the success of PS4 than driving the Nintendo brand into the ground. Phil has been doing a good job. I like that he's very active with the XB fanbase. @Einherjar the wiiU isn't really doing any better than it's been doing all along. The wiiU is unlikely to lifetime above 15mil, while I'd be surprised if the one doesn't hit 30mil. That said my comment is mostly flippant, as long as nintendo has a console they're not putting their games on competitors devices, and that's not happening any time soon. Nintendo has screwed up so bad lately that all I can really do is sit back and laugh, which is why a lot of my comments tend to be on the order of the sarcastic and flippant. NIntendo games ARE on the Xbox One. Like Perfect Dark, Banjo-Kazooie, Banjo-Tooie, Snake, Rattle, 'N Roll, RC Pro-Am I & II, Slalom, Cobra Triangle, Solar Jetman, and Conker's Bad Fur Day. @Yorumi The WiiU is a commercial failure, there is no denying that. And at the same time, its the that, in my opinion, provided a library worth owning a new system for. I literally cant tell you why the PS4 is selling like it does. Its library pretty much entirely consists of rehashed PS3 games and the few exclusive titles are all rather mediocre (opinion based of course, although their meta scores arent all that great either). This gen of consoles turned me, a life time console gamer into a full blown PC gamer with a side dish of Nintendo games. @Einherjar much of the criticism of the ps4 library applies to the wiiU library though. It's a lot of rehashed 3ds games and rather unabitious safe sequels. Even splatoon when you get right down to it feel rather half-assed. I mean they had a good idea so they developed a handful of maps and shipped it. I really think xenoblade X shows the stark, glaring contrast in output. We're just accustomed to open world games being riddled with bugs, and yet I'm not going to call it bug free but they sure put a lot of polish into it. The game is fun as can be, I've dumped dozens of hours into the game and I"m just getting starting. I could gush for hours but the point is monolith considers the game mid-tier, not AAA at all. Ok if something as amazing as XCX is mid-tier then what the hell is the rest of nintendo's output? NSMB? Mario Tennis? Amiibo scam? I think even smash and kart have to questioned under that standard. XCX isn't the only one, put nintendo's safe sequels up against some of the other great efforts on the system, lego city, monster hunter 3, hyrule warriors and such. Great games packed to the brim with content and fun through and through. That's been my problem with the wiiU library, it lacks ambition and other than a select few games feels very samey and lacking anything special. Are people still "salty" because of Microsoft´s Rare buyout? Not matter how much people want them to go back to Nintendo, they are now a Microsoft´s First Party studio. Nevermind, I think that if you really want to play Rare games, you should buy an Xbox as I did. Contrary to popular belief, Microsoft isn't the bad guy of the industry, and neither Sony and Nintendo. I understand the bad business decisions that Microsoft made in the beginning (that make me to avoid the Xbox One as a result), however, with Spencer as the head of Xbox Division, I saw they want to stay as good brand in the market by trying to release exclusives like Scalebound, and obviously Rare´s Sea of Thieves. I´m still a Nintendo fan, but I´m also an Xbox user since last generation because I want to play Rare games, and many other Xbox exclusives (hoping for a new Battletoads games). Colorful games with E and T ratings do horribly bad on Xbox and Playstation consoles. Minecraft is the weird outlier. Nintendo games would be met with the similar fate, because those who play on Xbox and Playstation mainly buy AAA blockbuster games and M-rated games. Everything else does Wii U numbers on these platforms. Also Microsoft's culture doesn't mesh will Nintendo's culture (nor does Sony's). @Rockmin everything that contradicts the "only dudebro shooters sell" isn't valid evidence, lol. Yeah having games on other systems is totally the worst idea I've ever heard, and this will RUIN Nintendo. And working with other companies? Terrible idea. @Yorumi Ol' Xeno sure is something else. Saying all XB & PS gamers are only into FPS games is as bad as saying Nintendo fan's only buy kiddie games. The mass majority doesn't speak for everybody. Well of course he wants the competition's exclusive selling points on his system. I'm sure Sony would want them too. How is this meant to be news? Come on NintendoLife you're better than this. Sony and Microsoft would bid Nintendo's assets sky high if they were ever for sale and be able to be brought to their consoles. As a fan, I hope it never happens and I own an Xbox One. Nintendo belongs on Nintendo consoles, although I do think they are right to finally attack the cell phone market. Ehh, nope. That's what Wii U is for. Hahahaha, that's hilarious! Sure, okay, the next main Mario 3D game with have kart racing in it instead, and the next Zelda game is something we'll have to create ourselves in Project Spark. Look I like Phil Spencer a lot, he's done a lot of great things to fix up the Xbone after it's awful reveal, but when the hell is Nintendo going to share out their games to other consoles? We are a long, long way off from them going third party. You would be happy to see Nintendo games on Xbox One? Well we would be happy to see Rare games on the Wii U and NX, where they belong. Give us Banjo first. Then will consider it. Who wouldn't want Nintendo games on their consoles? You only need to check any gaming forum to see the classic comments "I want Nintendo to go 3rd party because I want their games but not their hardware!". But please no. Keep Nintendo games on system where they are polished to them max. All that said.... Phil does look like a nice guy. They have Banjo and all the other rare games. Minecraft isn't. in essence, a Microsoft game. Just one they happen to own now. So really I don't see why anybody would be crying to see more Nintendo games on Xbox. This isn't news. Sony would love to have stuff like Mario and Zelda on PS4, it would give them an even larger monopoly. Hell, a solid Pokemon game would even bring the Vita back to the public eye. But I think Nintendo is definitely going down the road to being a 3rd party. Nintendo signed its own death warrant when they released the Wii, a console designed to make a quick buck off people who wouldn't stick around for the next console. The Wii U's name and terrible first ad campaign were the final nails in the coffin. Next add some cencorship, cringy localizations...Nintendo home consoles are dead. They can't compete anymore. Nintendo can keep the dedicated handheld market going, but even that will slowly die as more and more people start looking at mobile phones as viable gaming platforms (and those are only good for emulation imo). The NX won't do anything. It would be a miracle if it did. Nintendo needs to just call it quits and go 3rd party, they'd make some serious cash. Also I'd love to play Nintendo games on steam, then I only have to have a PC and nothing else. Yeah, I'll bet Microsoft would like to see some actual good games from a legendary developer like Nintendo to aid their struggling platform. @WaxxyOne Microsoft isn't the only one struggling with console sales. Last time I checked, Wii U wasn't doing so well either. Microsoft has been getting super cozy with Nintendo for a while now. Given some of the patent leaks we've seen lately, I wouldn't be surprised if we saw Nintendo games on Xbox... While at the same time never leaving Nintendo hardware. I could see the NX as being a small box that can connect to the Wii U, as well as Xbox and Windows. Using the box to contact Nintendo servers, while at the same time harnessing the local power of processors on your PC or game system. This would also be a strong partnership to push back against PlayStations commanding lead. I would LOVE to see Rare make games on the Wii U! Exactly what I came into post. Yeah, and Nintendo would love to see Halo 5 (or an older one if that one's not feasable) on the Wii U with Wiimote controls. Neither is going to happen as long as they remain console competitors. Minecraft is an exception, since for whatever reason Microsoft was willing to port it everywhere. @WaxxyOne The Xbox One has good games, and if Black Friday sales are any signs, it has a pulse. The Wii U is pretty much a dead platform, awaiting the day when Nintendo takes it out behind the barn and puts a bullet in its head to end its misery. Do I sound morbid? Maybe, but I own both a Xbox One and a Wii U. My Xbox One is still getting tons of support not just from Microsoft, but from other third-party developers. And let's be honest here, outside of Sony snapping up exclusive content that they help fund like Street Fighter V, 99% of the major third-party games will arrive on the Xbox One. The Wii U has been a barren wasteland this year, with major droughts and virtually every major third-party title skipping the platform. The Wii U has good games, that is a fact. But it has no changed the fact that the Wii U has no chance of ever overtaking the Xbox One, much less the PS4. The Wii U is on life support, awaiting the day when the NX arrives. And if the PS4's sales prove anything, its that the system with the better library does not always win. Both the Xbox One and the Wii U have better games then the PS4(which is pretty much selling on hype, promises of games in the future, and having the best graphics), but both are behind in sales. So, this year Xbox One got Rare Replay with 10+ original Nintendo games and Wii U gets only one Microsoft game, Minecraft? That doesn't add up. I'm sad that Minecraft sold out to M$... We all know what happened to other games and games companies that sold out. I fear Minecraft will be exploited until M$ can't wring another penny from it, and then abandoned, forever gathering dust at M$'s Redmond, WA lair. Banjo in Smash gets more likely every day. @sillygostly Microsoft is roughly 1/3 of the industry, dude. @MailOrderNinja Xbox really don't have anything great coming out. Neither does PS4. I am just going to stick to my WiiU/PC combo. Pretty much all the games on either xbox and ps4 are on the PC. @SirRandall I think it entirely depends what you like. You are certainly right that PC get almost everything anymore and with Xbox most of their big games are going Windows and Xbox. I tend to forget PC as mine is woefully underpowered. However Xbox has plenty of games I enjoy that are at least console exclusive and I can't wait for Scalebound, Sea of Thieves, Crackdown and ReCore. On PS4 you have so many first party or PS4 only smash hits coming next year or recently announced I'm going to have to get a PS4 I think. Especially with the announcement of Ni No Kuni 2. @ZenTurtle I think they've been extremely fair with it. Nothing has really changed and they could have easily pulled it from every platform not theirs.